Use Johnsonite vinyl wall base in any remodeling project or new construction. Vinyl cove base offers two profile choices and is an ideal substitute for wood base. You will find that Johnsonite vinyl wall base will have two options for the profile. One vinyl cove base profile will have a toe. This toe on the Johnsonite vinyl wall base will allow the gap needed with floating floors to be covered. You can also use the toe on the vinyl cove base to hide minor damage where the flooring meets the wall. Johnsonite vinyl wall base with no toe would be great for carpeted rooms. Use 6" tall vinyl cove base to cover damage to the base of your walls. Johnsonite vinyl wall base with 6" height would also help prevent more damage from happening. The .080" thickness of the vinyl cove base is lighter weight and ideal for low traffic or residential use. The 120' coil of Johnsonite vinyl wall base would allow you to achieve a near seamless installation. 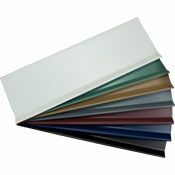 Vinyl cove base is offered in over 36 standard colors. Our Johnsonite vinyl wall base coils have a flat rate shipping fee no matter how many you order making this a fantastic deal. Once you are ready to start applying the vinyl cove base you will need to clean the base of your walls and inspect them for any imperfections that could affect the adhesives performance. The use of cove base adhesive is recommended for Johnsonite vinyl wall base installation. See the vinyl cove base installation video by Johnsonite for a basic explanation of applying the base. Coils are not always stocked at our warehouse and lead times can vary (typically 1-3 weeks). Please call to check availability and shipping time. Color can affect the price of the coils. Please select the color you would like to see correct pricing. Monitors will display colors differently. Please request color samples for accurate color representation. Add a stream line finish to every room with coils of cove base.